c. Adopted unilaterally; Montenegro is not a formal member of the Eurozone. 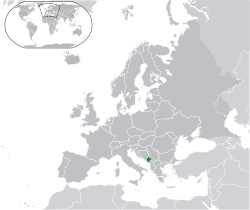 Montenegro (meaning Black Mountain) is a country in Southeastern Europe. It is on the Adriatic Sea, between Albania (to the South) and Croatia to the North. 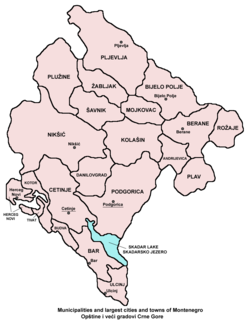 Inland (to the East and South-East) it also has a common border with Serbia, Kosovo and Bosnia and Herzegovina. The country came to exist when its people decided to split from the country Serbia and Montenegro on May 21, 2006. For most of the 20th century it was part of Yugoslavia. It had also been independent before World War I and existed as a kingdom. Its leader is Filip Vujanović. "Oh, Bright Dawn of May". The size of the economy's GDP is $4.114 billion and it has a population of 625,000 people. The traditional old capital of Montenegro is Cetinje, but Podgorica is the new one. The country adopted the Euro unilaterally; Montenegro is not a formal member of the Eurozone. ↑ "Language and alphabet Article 13". Constitution of Montenegro. WIPO. 19 October 2007. http://www.wipo.int/wipolex/en/text.jsp?file_id=187544#LinkTarget_1506. "Serbian, Bosniac, Albanian and Croatian shall also be in the official use." ↑ "Census of Population, Households and Dwellings in Montenegro 2011". Monstat. http://www.monstat.org/userfiles/file/popis2011/saopstenje/saopstenje(1).pdf. Retrieved 12 July 2011. ↑ 3.0 3.1 3.2 3.3 "Montenegro". International Monetary Fund. http://www.imf.org/external/pubs/ft/weo/2013/01/weodata/weorept.aspx?pr.x=15&pr.y=19&sy=2008&ey=2012&scsm=1&ssd=1&sort=country&ds=.&br=1&c=943&s=NGDPD%2CNGDPDPC%2CPPPGDP%2CPPPPC%2CLP&grp=0&a=. Retrieved 17 April 2013. This page was last changed on 2 October 2014, at 17:17.